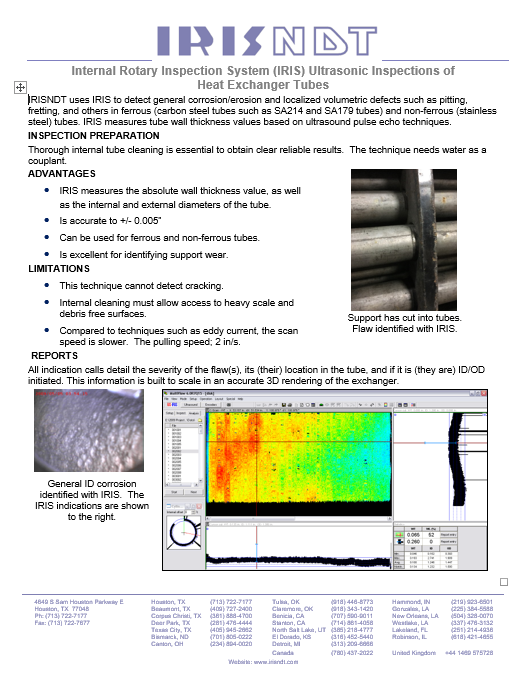 IRISNDT uses IRIS to detect general corrosion/erosion and localized volumetric defects such as pitting, fretting, and others in ferrous (carbon steel tubes such as SA214 and SA179 tubes) and non-ferrous (stainless steel) tubes. IRIS measures tube wall thickness values based on ultrasound pulse echo techniques. Thorough internal tube cleaning is essential to obtain clear reliable results. The technique needs water as a couplant. 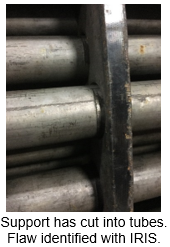 IRIS measures the absolute wall thickness value, as well as the internal and external diameters of the tube. Can be used for ferrous and non-ferrous tubes. Is excellent for identifying support wear. This technique cannot detect cracking. Internal cleaning must allow access to heavy scale and debris free surfaces. 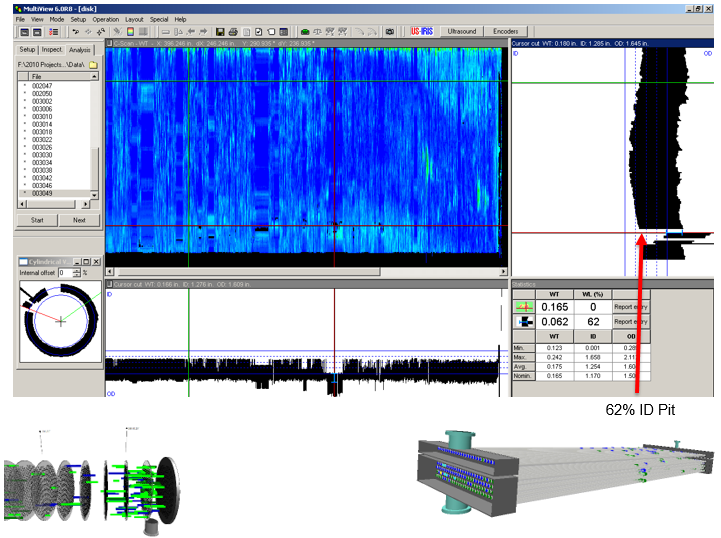 Compared to techniques such as eddy current, the scan speed is slower. The pulling speed; 2 in/s. All indication calls detail the severity of the flaw(s), its (their) location in the tube, and if it is (they are) ID/OD initiated. This information is built to scale in an accurate 3D rendering of the exchanger.